Embarking on an Adventure | Where Have You Been Lately? Have you spent a night with a bunch of trekkers? Not the rated-R type, okay. If not, well then let me tell you how our day ends and starts—constant packing and unpacking. We wrapped-up our day in Pokhara a little late than expected because of the delays during our land travel from Kathmandu. Add up our crazy packing, unpacking, packing, unpacking (repeat 10x). We were moving everywhere. Our stuff must be perfectly organized so we won’t have any problems during our trek. It’s a technique that all trekkers should master. So say 1AM late, yes, 1 AM late. We’re almost done packing here (stress on “almost done”). Wake-up call, 0500H. Breakfast, 0600H. All of us are already up even before we can press the snooze button on our alarm clocks. Maybe we are just excited for the first day of our trek to the base camp of the tenth highest mountain in world. Who won’t be? At 5:00 AM, most of us are done taking a bath. The remaining hour is spent, well, fixing whatever is wrong with the way we packed our things even if there is really none. When we already felt satisfaction, we headed out to the garden of the hotel. If you’ve read my previous post about my initial thoughts of Nepal, then this is where we left off—the shocker, the shocking view. Our awesome view from the garden of the Hotel Angel. Then off we went to Lake Fewa where you can have a fantastic view of the other snowcapped mountains of the north-central part of the Himalayas. 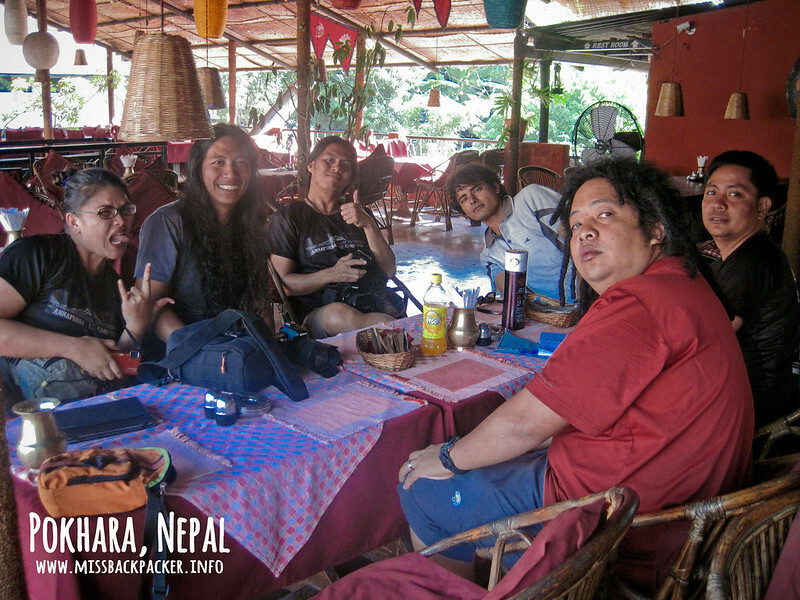 After taking a couple of pictures, we proceeded to the main dining and shopping hub of Pokhara for our breakfast. Lake Fewa and its colorful boats. It’s just a few minutes past 6:00 AM and the van that would bring us to Nayapul will pick us up at the hotel by 9:00 AM. We had plenty of time to think about our very first breakfast in Nepal. We could try either the Nepali cuisine or the usual Western breakfast. But I still went for eggs, bacon, and rice. I can’t live without rice. The team of The Himalayas Project with the, ahem, handsome Ramesh. After a short chit-chat and the getting-to-know part with our guide who would be with us for the rest of our stay in Nepal, we paid our bill and bid the restaurant owner goodbye. 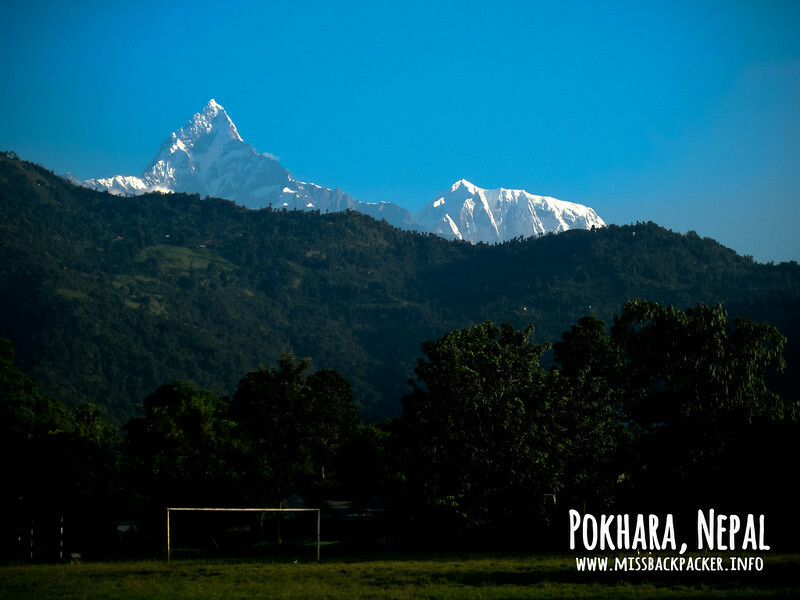 It’s just 8:00 AM and we could still roam around Pokhara. Besides, our hotel is just a good five-minute walk from where we were. I also had to buy an extra trekking shirt thinking that I what I brought wasn’t enough. I was able to buy myself a faux Marmot shirt for NPR 400 or PHP 200. We walked around a little more before heading back to the hotel. 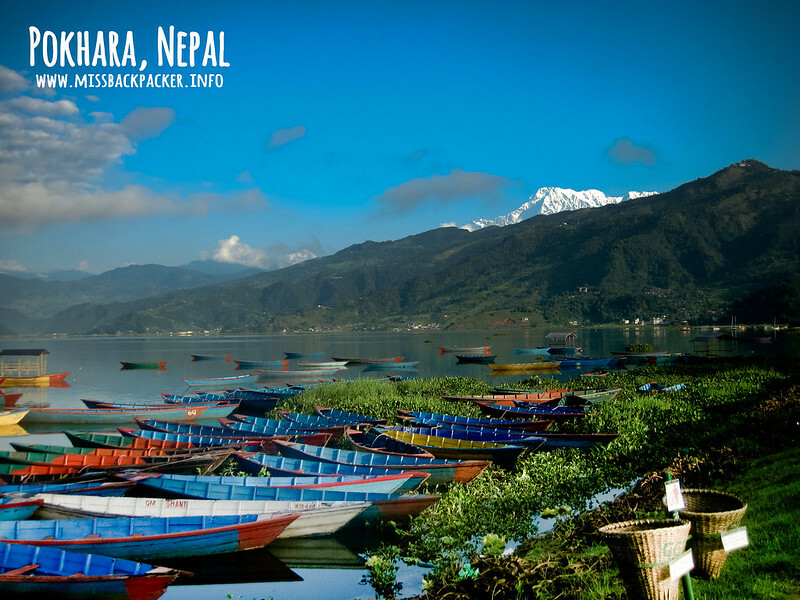 The peaceful aura of Pokhara is really different from the hustle and bustle of Kathmandu. It’s now 9:00 AM and the van’s already here. We could no longer hide the feeling of excitement. We were about to reach the peak of our trekking careers. The backpacks were loaded to the back of the van. We again said goodbye, this time to the staff of Hotel Angel. 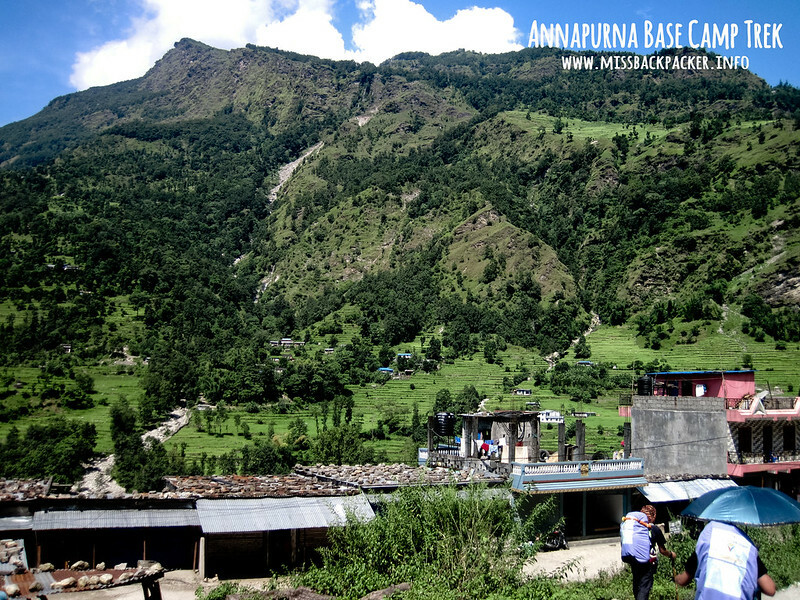 We were off to Nayapul, one of the jump-off points to the base camp of Annapurna and known to be the easiest among all starting points. The engine starts and so did our 45-minute ride. I wanted to take a nap but the scenic view is just amazing that I couldn’t close my eyes even for a minute. This went on until we arrived at our destination. It’s now 10:00 AM and the sun’s already at its prime, but our real adventure was just about to begin.